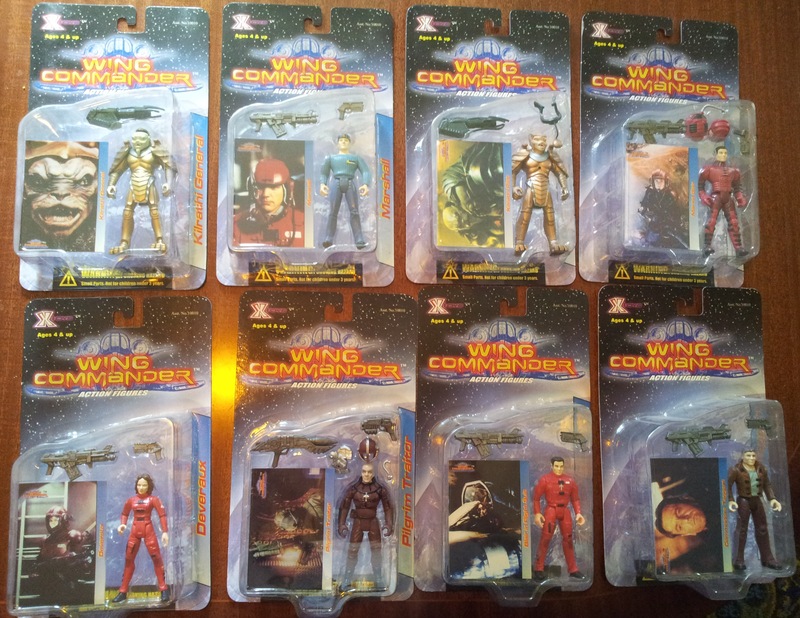 My latest addition to the collection is a full set of Wing Commander action figures. I can’t honestly say it is one of my favourites but I saw these going relatively cheap and it had to be done. This set of 8 figures was produced back in 1999 by X-Toys and strictly speaking they aren’t Origin collectibles as they tie in with the movie rather than the game. This ought to be reason enough not to own them for most people but the Wing Commander link won me over. I know some Wing Commander fans stick up for the movie but I could never bring myself to be one of them. Starting at the top left and going clockwise we have a kilrathi general, Marshall (Maniac), a kilrathi pilot, Blair in a marine suit, Taggart (Paladin), Blair in a flight suit, a Pilgrim traitor and last of all Deveraux (Angel). Whatever the quality of the movie, I can’t imagine anyone thinking that these are less than impressive as action figures go. They are aimed at a very young audience despite the PG-13 rating of the film, which along with other factors didn’t help sales and only around 10,000 were produced. Despite the relative rarity, I got the lot for about the price of one of the more expensive UO2 figures so there can’t be much demand. Not being all that decorative, the best use I can think of for these would be to create voodoo dolls of the more aggravating members of the cast but I expect I’ll find a spot for them somewhere. The back of the boxes mentions toy Rapiers and Dralthis which would have been a more welcome item for the collection judging by the photo’s. They were never produced however other than prototypes which currently reside at the Origin Museum. There are some photo’s and an article on these over at the Wing Commander CIC.